The Backup Service allows backing up and restoring DSE cluster data. 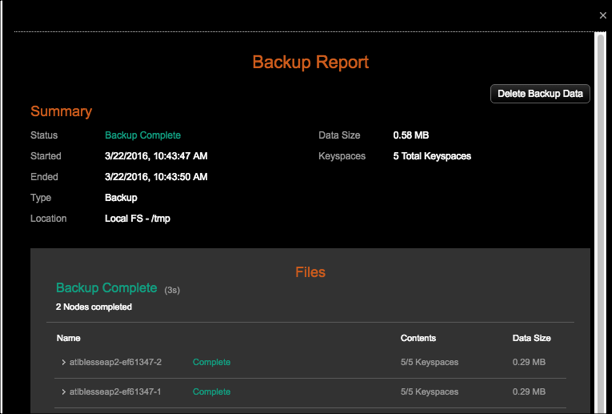 The OpsCenter Backup Service provides backup and recovery for enterprise data even though DataStax Enterprise has built-in replication. Reference of fields that are UI controls in the Backup Service dialogs. The fields appear in both Backup and Restore dialogs. In the Activity tab, click the backup for which you want to delete data. The Backup Report dialog appears. A dialog prompts you to confirm permanently deleting the data for the backup. The Status column in the Activity tab indicates Deletion Complete for the backup.